The country's favorite spot to grab a sub may come as a surprise. There's truly an art to making a perfect sandwich. Stars like Lance Bass, Giada De Laurentiis and Martha Stewart have shown Al Roker what goes into their favorite sandwiches on TODAY Food's "COLD CUTS" series. Each one has demonstrated that careful consideration is needed when combining bread, meat, cheese, condiments and all the fixings. America's favorite sandwich spot was recently announced, and surprisingly, an East Coast convenience store beat out all the big chains. Market Force Information, a customer experience media company, conducted a nationwide study to discover the best fast casual chains in the U.S. It surveyed 11,500 people to find out which restaurants folks were most loyal to in five fast food categories: Burgers, sandwiches, Mexican, pizza and chicken. The winners in four of the categories were big, national chain restaurants, but the sandwich category was won by an underdog. Wawa, a convenience store chain that's beloved by many East Coasters, had more loyal customers than chains that have restaurants all over the country. Wawa has fewer than 1,000 locations stretching along the East Coast. It's a quick-stop hub for convenience store snacks, soups, sides, coffee and sandwiches. But the people who love the sandwiches, really love them. The chain can get pretty crowded with its devoted fans. Many Wawa fans pity people who don't know about it. Honestly feel bad for the people who dont know what wawa is.. Some people might even de-friend any Wawa naysayers. The first Wawa opened in Folstom, Pennsylvania, in 1964. It now has locations throughout New Jersey, Delaware, Maryland, Virginia, Washington, D.C. and most recently, Florida. The chain won Market Force's survey by 64 percent, followed by Firehouse Subs, Jersey Mike's, Jimmy John's, Panera Bread and Subway. Arby's came in last. 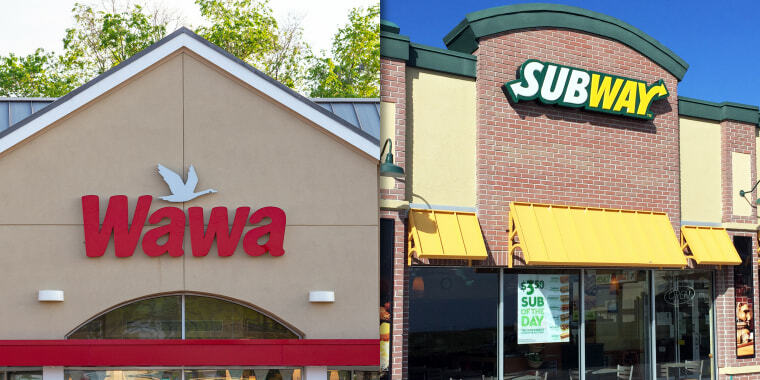 Wawa's win was the first time in the study's history that a convenience store rose above a sub shop. The winners of the other four categories in Market Force Information's study aren't nearly as surrprising. California-based In-N-Out Burger scored the most points for best burger, which comes as no shock since even infamously critical chef Gordon Ramsay enjoys it. Chick-fil-A aced the chicken category, as well as America's favorite fast food chain in a survey earlier this year. Chipotle beat out Moe's Southwest Grill, Taco Bell and Qdoba. And the Midwestern chain Pizza Ranch dominated Domino's, Pizza Hut and Papa John's.